Franklin Benjamin Richards is a fictional character appearing in American comic books published by Marvel Comics. The character is usually depicted as a supporting character in Fantastic Four. He's generally portrayed as a child and as a budding super-hero, albeit inexperienced. Franklin is a mutant beyond Omega-Level with vast reality-manipulating and psionic powers. He is the young son of Mister Fantastic and the Invisible Woman of the Fantastic Four, the older brother of Valeria Richards, and the nephew of Invisible Woman's younger brother, the Human Torch. His parents named him Franklin Benjamin Richards; his middle name is taken from his godfather Benjamin Jacob Grimm, the Thing. Franklin's first name comes from Franklin Storm, his maternal grandfather. He has started using the code name Powerhouse. In trying to be realistic, as we always did ... Sue Storm and Reed Richards in The Fantastic Four had been married for quite a while, and I figured the most natural thing in the world would be for them to have a baby. Then it occurred to me we could have a lot of fun with that, because we would assume that if two people with super powers have a baby, the baby might have a super power. But what super power would he have? And we could keep the readers guessing for years until the baby grew up. ... Of course, Sue's pregnancy took about a year and a half or two years, because comic book time is somewhat different than real-world time. And we wanted to stretch that out a long as we could while we tried to figure out whether she'd have a boy or a girl and what to name it. We finally decided on a boy named Franklin Richards. Appearing sporadically in the pages of Fantastic Four over the following fifteen years, Franklin became a member of the pre-teen superhero team Power Pack as of issue #17 (December 1985) of that title until its cancellation with issue #62 (February 1991). From November 1994 an older version of the same character (aged for the purposes of a story) appeared in the pages of Marvel's Fantastic Force until publication ceased as of April 1996. Between appearances in these other titles, Franklin has remained a recurring cast member of the Fantastic Four comic book. From July 2007 until the series' cancellation in February 2009, an alternate version of Franklin appeared as a cast member in the Marvel Adventures all-ages Power Pack series of titles. Franklin Benjamin Richards was born in New York City to Reed and Susan Richards. Unlike most mutants (whose abilities are initially activated at the onset of puberty), Franklin began manifesting his powers while still a toddler due to his parents' radiation-altered genes. [volume & issue needed] This drew the attention of Annihilus, who sought to use Franklin as a source for his own resurgence, transferring some measure of the child's latent power to himself with a gene-based machine, and releasing Franklin's full potential in the process. Fearing the immediate threat of his son's powers to the entire populace of Earth and unable to find another solution in time, Reed Richards shut down Franklin's mind. During a battle between Ultron-7 and the Fantastic Four, Ultron's energy output awoke Franklin and again released his powers, resulting in the sentient robot's defeat. Free of the energies expended in the confrontation with Ultron, Franklin was seemingly returned to his normal power level. Needing someone to watch over Franklin in their absence, Reed and Susan Richards came to rely on the services of an elderly woman known as Agatha Harkness,[volume & issue needed] who is also a benevolent witch. Franklin and Agatha soon developed a familial-like bond, even residing together for a time at Whisper Hill (Agatha's old residence, which was regularly destroyed and rebuilt). Eventually, Agatha returned to live in the secret witch community of New Salem, Colorado, and Franklin moved back in permanently with his parents and the rest of the Fantastic Four. [volume & issue needed] His powers, no longer dormant, continued to manifest themselves. Under the care of yet another guardian, a robot nicknamed H.E.R.B.I.E., Franklin unintentionally used his reality warping abilities to age himself into adulthood. In this form, Franklin was an adept at molecular manipulation and psionics. Upon realizing his mistake, he soon restored himself to childhood. Despite his youth and inexperience, Franklin, a victim of many threats and abductions, has exhibited great courage in the face of overwhelming peril. Time and again, he has unknowingly saved innocent lives, including that of his famous family, from the likes of villainous perpetrators, such as Blastaar, Norman Osborn, Onslaught, Nicholas Scratch, and even the all-powerful Mephisto, whom he temporarily destroyed and later defeated on two separate occasions. The first appearance of Franklin Richards as the superhero/Power Pack member Tattletale (Power Pack #17, December 1985), alongside the similarly-aged Katie Power, who suggests his codename. Art by June Brigman. A promotional advertisement for the "Fall of the Mutants" storyline which ran in various Marvel Comics cover dated November 1987. 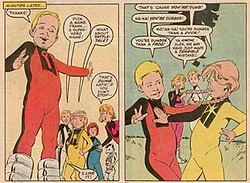 Franklin Richards is pictured at the far right in his "Tattletale" costume. Art by Jon Bogdanove. The Richards and Power families became fast friends, though neither family's parents realized that any of the children other than Franklin were superpowered (though Susan and Reed discovered this later). Franklin even kept his membership of Power Pack a secret from his own parents: when he appeared before them in image form (see above) he would stick to ordinary clothes, only appearing in his Power Pack outfit before other heroes such as Kitty Pryde. Franklin was later kidnapped by his time-traveling grandfather Nathaniel Richards, and replaced with his teenage counterpart, Psi-Lord, who had been raised by Nathaniel in a dimension outside of time. [volume & issue needed] Franklin, as Psi-Lord, helped create the short-lived team known as Fantastic Force. [volume & issue needed] By tapping a stud hidden within the glove of his costume, Franklin was able to summon battle armor from a pocket dimension; it was designed specifically to siphon off the full measure of his powers. As such, Franklin's abilities at this time were limited to telepathy, precognition, and psionic energy blasts. Nathaniel eventually revealed that in another possible future timeline, Franklin Richards would, with Rachel Summers, father a terrible time-and dimension-traveling supervillain named Hyperstorm. In an effort to divert the attention of the Fantastic Four, Hyperstorm traveled back to the precise point in time when Franklin was abducted by Nathaniel Richards; he returned the child to his parents mere seconds after he was first kidnapped, thus rendering the Psi-Lord version of Franklin Richards obsolete in the Earth-616 timeline. In the wake of Mr. Fantastic's activation of the Ultimate Nullifier to destroy Abraxas, Franklin loses all his powers in the process of reforming Galactus and thus becomes a normal child. Shortly afterwards, Doctor Doom makes a pact with the Haazareth Three to gain vast magical power. During Doom's attacks upon the Fantastic Four, Franklin is sucked into Hell by the Haazareth. After the defeat of Doom, his parents rescue him, but Franklin has a hard time coping with the traumatic experience of being tormented in Hell. The Thing helps Franklin make a complete mental recovery by assuring him that, even if they couldn't always keep him safe, they would never give up on him. During the Dark Reign: Fantastic Four miniseries; Franklin finds himself along with his sister under siege by Norman Osborn, Venom and a high number of H.A.M.M.E.R. agents. The siblings were on their own due to their father's experiment which left him unreachable and the other members of the Fantastic Four stranded in alternate realities. Valeria manages to separate Osborn from the rest of the H.A.M.M.E.R. agents by using a bureaucratic technicality and by having them underestimate her. Osborn is led into a room where he faces Franklin who is wearing a Spider-Man mask and calls him a villain. In the next scene, the two are chased down a hall by Osborn who is getting ready to shoot them. The Fantastic Four return just in time to protect the children. Mister Fantastic tells Osborn to leave the Baxter Building and not to come back. Osborn attempts to shoot Reed, only to be shot in the shoulder by Franklin. The gun Franklin used is by all accounts, a simple toy. On his birthday, Franklin is seemingly attacked by a strange intruder which is later revealed to be a future version of Franklin himself sent back through time to deliver a warning to Valeria about an approaching conflict. In the final pages, it is revealed that the attack by the adult Franklin was to plant a telepathic suggestion in the mind of his present-day counterpart, thereby reawakening young Franklin's dormant mutant powers. Franklin and his sister contact X-Factor Investigations, led by Madrox the Multiple Man. They find that their mother has strangely disappeared and think that their father had something to do with it. According to the children, Reed Richards had been acting very strange the last couple of days. The team investigates and find that not only Sue was trapped, but also Reed, who has been replaced with an alternate version being mind-controlled by an alternate version of Doctor Doom. X-Factor find the real Reed in Latveria. X-Factor and the Fantastic Four battle Doctor Doom and Layla Miller. Doom lets them "rescue" Sue and tells them all to leave. During the battle in New York, the alternate Doom/Reed is accidentally killed. During the Fear Itself storyline, Franklin, against his father's prior wishes, uses his reality-warping powers to free Ben Grimm from the possession of an Asgardian warrior general named Angrir: Breaker of Souls by transforming him back into the Thing. Franklin is approached by a mysterious stranger, who has been secretly tutoring him in the use of his powers. The stranger is later revealed to be a future adult incarnation of Franklin himself, who reiterates to his young counterpart that his powers must be properly harnessed for a singular intent: the act of life preservation. In a confrontation between the Future Foundation and the Mad Celestials of Earth-4280, Franklin is described by one of the Celestials as a mutant 'beyond Omega classification', and is subsequently attacked with concussion beams. Franklin repels their attacks. Upon successfully creating a new future and simultaneously acting as an anchor for the changes he made in the process following the collapse of all reality into a single timestream, culminating with the heat death of everything, the adult Franklin, alongside his sister, a future incarnation of Valeria Richards, enters the fray in the final struggle against the Mad Celestials of Earth-4280. He warps the three Celestials away to the inner sphere of a local gas giant. He then acquires an orb containing his younger counterpart's powers, which he stores within his chest. When the Celestials return, the adult Franklin again confronts them, and destroys them all in a prolonged battle. In the aftermath, the adult Franklin shares a brief moment with Galactus. The two discuss the heat death of everything and the revelation of Franklin's immortality, specifically that he will, billions of years from now, stand beside Galactus to witness the birth of a new universe. Some years later, Franklin Richards' reality-warping abilities was getting depleted from rebuilding the Multiverse as he, his parents, Valeria, and the Future Foundation are confronted by the Griever at the End of All Things. During this time, he has taken up the codename of Powerhouse. Franklin is a mutant who possesses the power to warp reality, i.e., to make any thought or desire come to fruition, even up to a cosmic scale. He is able to rearrange the molecular structure of matter and energy at will. Franklin once subconsciously created his own pocket universe, encompassing a virtual replica of Earth-616. As a result, several cosmic entities, including Galactus, Eternity, and Infinity, as well as Omniversal Guardian Roma and Omniversal Majestrix Opal Luna Saturnyne, began to take notice of Franklin's tremendous gifts, going so far to describe him as a "being whom the Celestials felt was on par with themselves". Two Celestials, Ashema the Listener and Nezarr the Calculator, were at one time tasked with retrieving Franklin for evaluation as a new member of the Celestial Host, a group of beings recognized as "gods" by the Eternals and Deviants. In addition to reality and molecular manipulation, Franklin has vast psionic powers that have manifested as telepathy, telekinesis, energy blasts of concussive force, precognition, and astral projection. Being a child, Franklin's abilities are restricted to an extent by his limited control. Moreover, it remains unclear what power levels Franklin will ultimately achieve as an adult, as several future incarnations from alternate realities as well as the mainstream Marvel universe have been shown to vary in power. One such manifestation of Franklin in adult form was able to destroy two Celestials from Earth-4280 during physical combat; in the aftermath of their defeat, Franklin's immortality was strongly implied. The same individual also tapped into the power of his younger self to resurrect and transform Galactus into his own personal herald after the Devourer of Worlds had been rendered unconscious in battle against a host of Celestials. The dream-self of the deceased adult Franklin Richards of Earth-811 (seen in the 1990 Days of Future Present crossover) tapped into the powers of both his younger Earth-616 counterpart and Rachel Summers, augmenting his own abilities with the near-infinite energy of the Phoenix Force. In Fantastic Four: Annual 1998, a version of Franklin is seen where he aged in real time from his first appearance. He is married to a Wakandan woman named Zawadi and has a daughter named N'Yami. Franklin is also a member of the Fantastic Four named Zero Man and had the ability to access the Negative Zone through a portal that he could create. He had to wear a special Vibranium headband to help him control his abilities. The Exiles, a group of superheroes taken from several different realities, traveled to a future Earth where their mission was to stop Franklin Richards' son from conquering that world. [volume & issue needed] Franklin himself is not shown in this storyline. In the out-of-continuity humor series Franklin Richards: Son of a Genius, Franklin is portrayed as a Calvin-esque troublemaker who can't resist "playing" with his father's inventions, with disastrous results. Franklin must then scramble to reverse the effects/clean up after the results of his "play", with the help of his long-suffering robot nanny H.E.R.B.I.E. (who essentially plays a Hobbes-esque role), or face punishment from his parents. The first twelve Son of a Genius one-shots were drawn by Chris Eliopoulos and co-written by Eliopoulos and Marc Sumerak. Since then, Eliopoulos has written them solo. Franklin Richards: Son of a Genius began as a series of back-up strips, each one appearing in all Marvel books released in a certain publishing week. The strips were well received by Marvel readership and the concept was granted a self-titled one-shot, which primarily reprinted the published strips to date. Subsequent books in the series have consisted of new material, and they are currently being published on a roughly quarterly basis. There have been fourteen specials published so far, and this particular version of Franklin and H.E.R.B.I.E. has since appeared with Lockjaw and the Pet Avengers in Tails of the Pet Avengers: Dogs of Summer (July 2010). In House of M, Franklin is mentioned by Emma Frost as being one of her patients since the death of his parents. In the Marvel Zombies: Dead Days one-shot (which served as a prequel to the Marvel Zombies 2005/2006 miniseries), Franklin and his sister Valeria were suddenly eaten by zombie She-Hulk. In the MC2 universe, Franklin is in the Fantastic Five under the name of Psi-Lord, his powers reduced to telekinesis after a battle with Hyperstorm. He's also that universe's Nexus Being, someone who exists in all possible realities, a focus of mystical energies. He has a friendly relationship with Spider-Girl. They are mutually attracted to each other until her father, Spider-Man, points out that she is only 15, several years younger than Franklin. After that, Franklin stops flirting with her. It was revealed that Franklin recommended Kate Power to help the Avengers find the powerless Thunderstrike. During Fantastic Five (volume two) #4, a huge increase in his powers, triggered when Franklin deliberately exposes himself to cosmic rays to enhance his powers to cope with the threat posed by the newly returned Doctor Doom, leaves him with stronger psionic powers and with a blazing skull for a face, forcing him to wear a containment helmet at all times. In the Fantastic Four and Power Pack miniseries, an alternate timeline Franklin Richards is promoted a few grades and enrolled in the same class as Jack Power. Because of persecution as a result of him having the Richards name, Reed later decides that he should be kept in the Baxter Building for home schooling, possibly as long as college. Franklin then runs away with Jack, then proceeds to get captured by Doctor Doom. Doom switches bodies with Franklin for a short time to pursue the destruction of the Fantastic Four, leaving Franklin trapped in Doom's comatose body. When Jack Power undoes the body swap, Franklin wakes up and immediately leads the Power Pack in sending Doctor Doom to the Negative Zone. After this adventure, Julie Power creates a costume for Franklin, dubbing him the "honorary fifth member". The costume looks like a standard Power Pack costume, done in orange and having the all-seeing eye icon of his "Tattletale" costume from the original series. Although the costume was made of regular materials instead of using the alien materials that accounts for the special abilities of the other Power Pack costumes, Franklin's father has modified the "Tattletale" costume using unstable molecules. In the Power Pack: Day One miniseries, Franklin is staying with the Power family, due to the Fantastic Four going on a space mission. During his stay, Franklin is learning from the Power siblings the origin of how they became Power Pack. In the first issue of the Skrulls vs. Power Pack miniseries, Franklin and the Power siblings were at a bowling alley, when they were attacked by bounty hunters. While the hunters captured and delivered the Pack to Patchworld, Franklin managed to return to the Baxter Building to ask his parents to help rescue them, but instead depended upon the aid from both the Smartship Friday and his robot nanny H.E.R.B.I.E. This version of Franklin to date hasn't displayed any powers; he does have great courage and intelligence. He also has some impressive high-tech gadgets that Reed and Franklin built together. These save his life during the Galactic bounty hunter attack. Franklin, the Power siblings, H.E.R.B.I.E., and Friday eventually reach the Puzzle Planet and solve the mystery of the planet of origin of Eternity's Children, as named in an ancient secret prophecy. All the children do their part with their intelligence and powers to solve the puzzles, but it is Franklin who ties it all together with his scientific knowledge and analytic ability. With the main continuity, the "Son of a Genius" series, and the all ages version of Power Pack, there are now three different versions (within the different continuities) of Franklin Richards fighting the Skrull invasion. In an alternate reality detailed in New Warriors #11–13, the Richards family is part of a resistance movement against the tyrannical Sphinx. They join with the family of Dwayne Taylor. Despite their age differences, Franklin and Dwayne are shown as friends. An attack by agents of the Sphinx leaves all but Dwayne murdered. In Power Pack #36 (published in April 1987), Franklin and his friends battled the giant robot Master Mold. The Master Mold's primary objective was to eliminate The Twelve, the future leaders of mutant-kind. Describing Franklin as a mutant entity of the "ultimate" potential, and the only mutant ever to develop such power, the machine visualizes possible future incarnations of the child prior to seeking him out for annihilation. One image depicts Franklin as a young man clad in a dark blue suit with a red jacket, yellow boots, yellow and gloves. Master Mold refers to this adolescent version of Franklin as Ultiman. Another image shows a striking figure somewhat older in appearance than Ultiman (closely resembling the Silver Surfer) with marks upon his face similar to the "hound scars" commonly associated with Rachel Summers of Earth-811. As per Master Mold, this adult incarnation of Franklin is simply called "The Twelfth". 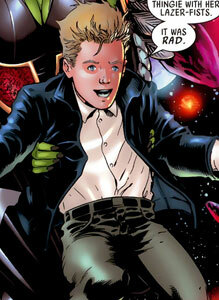 In Ultimate X-Men/Fantastic Four Annual #1, a young Franklin Richards is part of a future team of X-Men. It is revealed that in all of the possible futures, Franklin is Reed (as Nihil) and Sue's son. He is also revealed to be the host to that timeline's Phoenix force. Franklin Richards (alongside members of Power Pack) makes a cameo appearance in The Super Hero Squad Show episode "Support Your Local Sky-Father!" at a playground Thor is opening, appearing in a blue T-shirt marked with a "4". In the game Marvel: Ultimate Alliance, Franklin is briefly mentioned when speaking to the Invisible Woman in the Hall of Warriors on the Asgard level. In the game's sequel, Marvel: Ultimate Alliance 2, Franklin is seen sleeping alongside his sister Valeria Richards. He is left in the care of his father Reed Richards when his mother leaves to join the Anti-Registration movement. 2008: Chris Eliopoulos was nominated for the "Special Award for Humor" Harvey Award for his work on Franklin Richards. ^ a b Fantastic Four Vol. 6 #2. Marvel Comics. ^ "[EXCLUSIVE] Marvel Preview: Fantastic Four #2". Adventure is in Poor Taste. September 6, 2018. Retrieved September 6, 2018. ^ Thomas, Roy (August 2011). "Stan Lee's Amazing Marvel Interview!". Alter Ego. TwoMorrows Publishing (104): 38–39. ^ Fantastic Four #227 — "The Brain Parasites!" ^ Fantastic Four #244 — "When Calls Galactus!" ^ Fantastic Four #245 — "Childhood's End!" ^ Fantastic Four #216 — "Where There Be Gods!" ^ Fantastic Four #277 — "Back From Beyond"
^ Skrulls vs. Power Pack #4, October 2008.